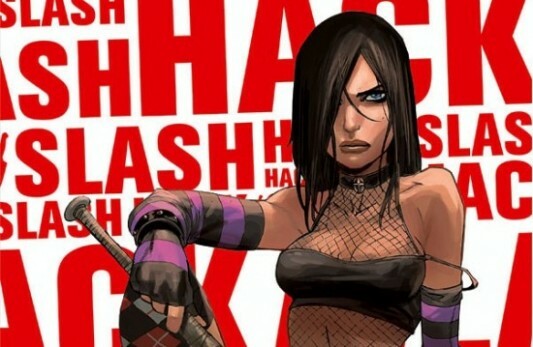 One comic book-to-movie adaptation that many have been excited about is Hack/Slash, based on the comic of the same name created by Tim Seeley and Stefano Caselli. Unfortunately there’s been some delays and complications in getting the project moving, and so those who are excited have had to wait impatiently for movement. Now it appears things are picking up for the Relativity Media title, though whether you will still be excited or not is worthy of discussion. It’s being reported that Marcus Nispel, the German director known for brutally violent remakes like The Texas Chainsaw Massacre, Friday the 13th, and this past summer’s Conan the Barbarian, has been brought in to deliver Hack/Slash to the masses. He replaces Fredrick Bond, who was previously attached to direct. 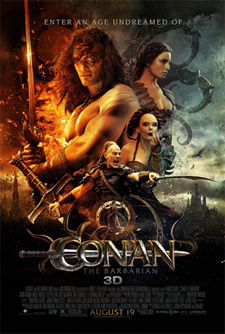 The digital rental deal of the day over at Amazon today is Conan The Barbarian (2011) for only $.99. This deal is valid only for today, Wednesday, January 10, 2012, until 11:59pm PST. Once you activate the rental through Amazon’s Instant Video on demand service, you’ll have access to the movie for 24 hours. If you’re interested in purchasing the digital version, the cost is $14.99. Also, if you’d like to own a physical copy of Conan The Barbarian, the 3D Blu-ray/DVD Combo Pack is available for $23.49 while the DVD is $16.99. The Blu-ray edition is part of Amazon’s “Buy This DVD and Watch it Instantly” program — you get the film as a FREE digital rental you can watch immediately when your purchase the physical copy. Easily this weekend’s biggest release (unless you are looking forward to something like Fright Night, which for all intents and purposes should be the case, as that film truly rules), Conan The Barbarian makes its return to theaters this Friday, and in anticipation of that release, Lionsgate has gone out and posted a brand new trailer. And for this one, you control what you seen. The studio has released a new, interactive, red-band trailer for the Jason Momoa-starring film. Check it out here below. A new red band trailer for the upcoming Marcus Nispel remake, Conan the Barbarian, has been released, and it’s much more along the lines of what people want to see. The first full trailer was intriguing enough, but the original 1982 Arnold Schwarzenegger movie was about a warrior tearing his way to vengeance against the man who killed his people, and with this new trailer it appears Nispel hasn’t held back on going all-out on the bloody revenge thing. That’s all we really care about with this movie, correct? You can see the new Conan the Barbarian red band trailer by continuing on now. Be warned: because it is red, the trailer has plenty of NSFW goodies going on. A brand new poster for the Marcus Nispel (Friday the 13th, The Texas Chainsaw Massacre) remake of the 1982 Arnold Schwarzenegger title, Conan the Barbarian, has been released online. The movie stars Jason Momoa (Game of Thrones) as the barbarian hero, as well as Rachel Nichols (G.I. Joe: The Rise of Cobra), Stephen Lang (Avatar), Rose McGowan (Scream), Saïd Taghmaoui (Vantage Point), and Ron Perlman (Hellboy). If you haven’t seen the trailer for Conan the Barbarian yet, you can see it right here at Geeks of Doom, and you can click on over to the other side now to check out the new poster. 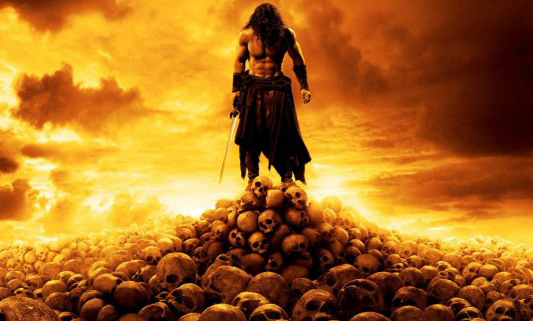 The first full-length trailer for Conan the Barbarian is now online. The new movie, directed by Marcus Nispel, is based on the universe created by Robert E. Howard and is a remake of the 1982 film that starred Arnold Schwarzenegger as the title barbarian. The teaser trailer released last month left a lot to be desired, but now the longer theatrical version shows that this movie actually has potential (now whether you can stand remakes in general is another thing). Jason Momoa plays the title role here and at first, I wasn’t sure if he was the right person to wield the blade, but he’s won me over, especially after seeing the actor recently in HBO’s new series Game Of Thrones. The first teaser trailer for Conan the Barbarian has finally made its way to the web, and you can see it here now. The movie is directed by Marcus Nispel (Friday the 13th, The Texas Chainsaw Massacre) and tells the story of a man whose entire village is slaughtered. When this man finds the ones responsible, he makes it his mission to avenge those who were killed while having to battle all sorts of mythical creatures and beasts and dangers along the way. 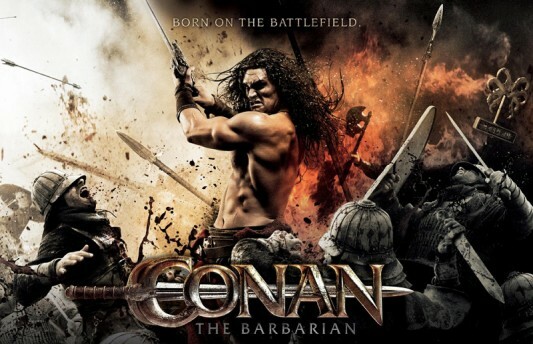 You can continue on below now to check out the first teaser trailer for Conan the Barbarian. The movie will be released on August 19, 2011. 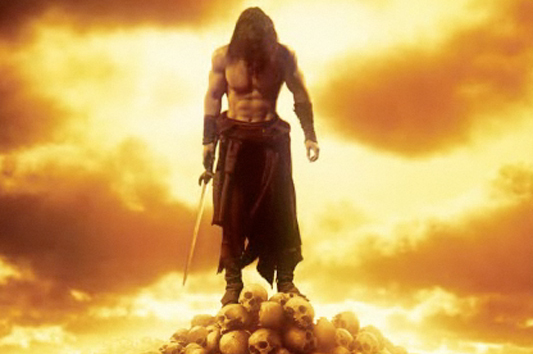 Lionsgate has released a motion poster for the new 3D reboot of Conan The Barbarian, with imagery inspired by the classic Conan artwork by the late Frank Frazetta. IGN debuted the poster earlier today, and you can see it embedded here below, courtesy of the official movie site. It’s a great motion poster, but beware, the audio is defaulted to “on” so if you need to turn the sound off, click the AUDIO: OFF button at the bottom right corner of the poster. The first batch of images from the set of the remake/reboot of Conan the Barbarian have shown up online at the film’s official Facebook page. Conan tells the story of a man whose family and fellow people are all slaughtered at the hands of an evil man named Khalar Singh. After this Conan sets off to find Singh and anyone else who was involved, and get vengeance for what they did to him. The movie is directed by Marcus Nispel, who previously directed the Friday the 13th reboot and Pathfinder. It stars Jason Momoa as Conan, Ron Perlman as his father Corin, Stephen Lang as Singh, Rachel Nichols, and Rose McGowan. Head on over to the other side to check out the images.